Here’s Some New Info on The New ‘Child’s Play’ Film!!! For so long now, we have been hearing about a new ‘Child’s Play’ film. You know the films with the killer doll named Chucky? Well, over the past couple of years, we have heard there will be a sequel as well as a reboot to the franchise. We also heard that the reboot was going to return to the darker side of things rather than it be more of a slapstick type comedy as the previous two Chuky films have been. Well, this Chuck film will be a sequel to the already five films of the franchise. 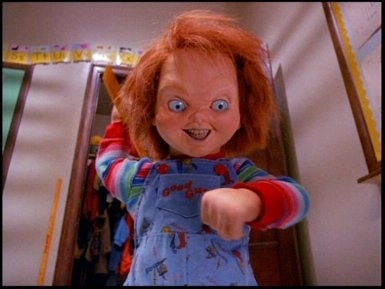 According to MovieHole, it’s called ‘Curse of Chucky’ and will be written, produced, and directed by Don Mancini. Mancini created the Chucky universe and directed one of the films. Sadly, the new film will be straight to DVD, which I think is a bad move. There is a huge enough following for it to get a theatrical release. Even if it is just midnight shows. The synopsis is: Chucky arrives to wreck havoc within a family that’s regrouped for a funeral. In the wake of her mother’s passing, a young woman – in a wheelchair since birth – is forced to put up with her sister, brother-in-law, niece and their nanny as they say their goodbyes to mother. When people start turning up dead, the fearless Nica discovers the culprit might be a “strange doll” she was sent a couple of days earlier. Here is some good news though, Brad Douriff, the voice of Chucky in every film will return to the character. And like I said above, they want to return to a scarier theme, so this new one will be more frightening and less Jennifer Tilly. Main characters in the film include heroine Nica; Barb, Nica’s older sister, a manipulative, controlling cow that nags her handsome husband Ian and 5-year-old daughter Alice; and Jill, the “smokin’ hot” nanny that’s sleeping with Ian. There’s also fun supporting characters like a meddling priest, who will come face-to-cross with Chucky, and of course, the deceased woman, mother Sarah. This sounds like it could be the start of something great. Blu-ray Review: ‘Child’s Play’ Collector’s Edition! This entry was posted on Monday, June 25th, 2012 at 2:36 pm	and is filed under Film, News. You can follow any responses to this entry through the RSS 2.0 feed. You can skip to the end and leave a response. Pinging is currently not allowed. « Los Angeles Film Festival Winners Announced!!! ‘Beasts of the Southern Wild’ Wins Audience Award!! !